Trask, who serves on the NFL‘s Security Committee, said all teams in the league are serious about the safety of fans in the stands and in stadium parking lots. San Francisco police are looking for a person of interest in one of two shootings at the preseason football game at Candlestick Park. Authorities were still sifting through evidence and puzzling over whether the incidents involved opposing fans. One of the shooting victims was wearing a T-shirt with an expletive-laced anti-49er slogan, according to police. The violence occurred during and after the 49ers’ 17-3 victory Saturday night in their home stadium. Videos taken by fans and posted online depict fights and aggressive behavior in the stands during the game. Callers to a Bay Area radio show Sunday said they had to navigate a gantlet of drunk and abusive fans just to go to a restroom. Sgt. Michael Andraychak of the San Francisco Police Department said police and stadium security officials assigned extra staff to games between teams with a strong rivalry or whose fans have a history of violence. The 49ers-Raiders contest fit both those criteria and extra police were on hand. A 24-year-old man who was shot multiple times in one of the parking-lot incidents remained in critical condition Sunday. After being shot, he managed to drive to a security office for help, Andraychak said. Another man in his 20s who was shot numerous times remained hospitalized with less threatening injuries, according to police. A 26-year-old man from San Rafael who was beaten unconscious in a stadium bathroom was hospitalized in serious condition, police said. The names of the victims have not been released. Andraychak said no suspects were in custody. The shootings are being investigated as separate incidents, he said, but police are seeking any possible links. I read all that, but all it translated to in my mind was, “I’m Amy Trask, I’m the Chief Executive of the Oakland Raiders, I’ve never actually attended a Raiders game, I have zero perception of reality, I’ve never opened a dictionary, and I live in the clouds with Care Bears.” I honestly believe that all the “stereotypes” of Raiders’ fans have helped their reputation. 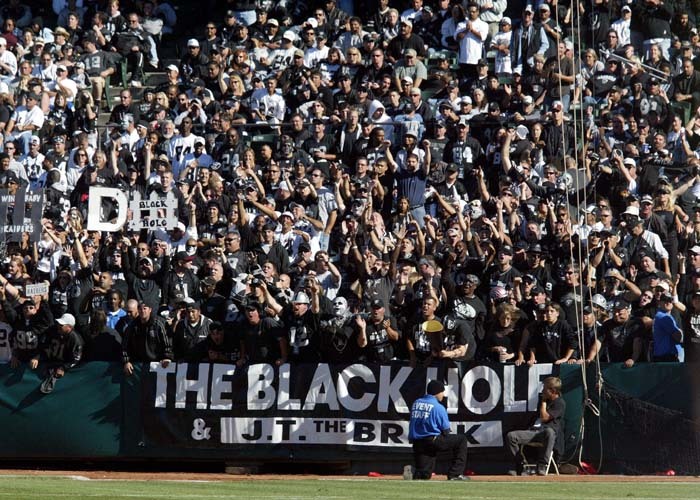 People from Oakland and LA have been bitching about their stereotypes for years, so… you see tons of articles and shows dedicated to the fun loving fans of the black hole, school teachers that are big teddy bears that think it’s fun to dress up on the weekends. I get that. 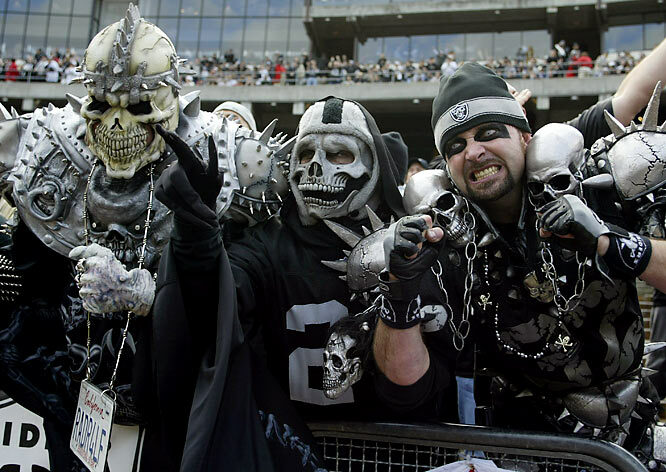 I get that Raiders fans are real people. I get that some of them are wonderful people that will give me big hugs in heaven someday. Yeah well, for every one model-citizen Raider fan, there are about 50 thugs attending these games. As for these incidents… all 3 of them, one with minor injuries and two separate shootings…if it comes out that they were all Niners fans just beating each other up, everything I say in this post remains true. Road trip story. Showman my buddy Dave and I took a group of guys, some Jr. High and High School kids, to a Chargers vs. Raiders game once at the Oakland Coliseum. It was the season opener in 2006, a Monday Night Football game. The Bolts ended up crushing the Raiders 27-0. Since they were young, I told them they weren’t allowed to wear any Bolts gear or colors. Just dress normal. That worked. The second we walked through the parking lot, Raider fans started calling us “coward s” and “pussies”, throwing trash and beer cans at us as we walked by. I quickly discovered that if you’re not wearing something with Raiders logos all over it, or dressed in all black… you are the enemy. Didn’t even have to wear the visiting team’s colors. If you were not in their colors, they knew. This continued inside the stadium. Trash thrown at us, beer thrown down our backs, tons of yelling and cursing, and we witnessed multiple fights go down with Bolts fans that were brave/stupid enough to rock LT jerseys. Not even kidding, felt like a totally irresponsible adult for bringing these kids to the game. We were not safe. Oh, and the fans I was afraid of…weren’t these guys. The fans I was afraid of, were the ones like this guy. I’m all for breaking down stereotypes. But when you witness multiple first hand unprovoked attacks, those aren’t stereotypes anymore. Those are truths. So, although there are some good Raiders fans out there…they’re more likely to stay at home and watch from their own couch. You know, just like you do, Amy Trask. This entry was posted in Football, News, NFL, Tattoos and tagged 49ers, Football, NFL, niners, oakland raider, Raiders, raiders fans, raiders game fights, tattoos. Bookmark the permalink.